When properly done, seeding in the Spring can produce a healthy and lush green lawn. Knowing what type of grass you have, and the proper steps to take, helps create better results. The steps for overseeding both kinds of lawns is the same. Below are some tips to help you use that method successfully. 2. If your soil is compacted, areate the lawn before planting seed .It will make it easier for the new grass to establish. 4. Mow the lawn very short before overseeding, but do not scalp it. When the new grass starts to grow you will want it to get enough sunlight and the taller grass around it could block that out. 5. Sow the recommended amount of seed split in two different directions across the yard. There should be directions for how much seed to use in the instructions on the bag. You can sow by hand or with a seed spreader. 6> Good seed to soil contact is important to the germination process. Raking the lawn after seeding, especially in thinner spots, is helpful. Add an 1/8th inch layer of topsoil to bare spots. Moderate temperatures and moisture are important to freshly planted trees . It is important to plant at a time when the tree will have time to acclimate to the soil and to start growing roots in their new enviroment before being exposed to any extremes in weather. This makes the best ( not only) times to plant early springtime and mid autumn when most of the energy of the tree is directed towards root growth. Dig the hole shallow and wide - A common mistake people make when planting is digging the hole too deep and not making the hole wide enough. It should not be deeper then the root ball of the tree, Iit should be two to three times the width of the container that the tree came in. A couple of inches of sand or loosely packed potting soil mixed into the bottom of the hole will help with drainage and make it easier for roots to start growing. It is also a good idea to score the sides of the hole for the same reason. If this step is not done, you may just be creating a ‘bowl’ that will hold water and your tree will slowly rot from the trapped moisture. Carry the tree from the bottom - do not to pick it up by the trunk. Remove the tree from its container - put on its side and pull carefully. Try to gingerly loosen and spread roots before planting. If the roots are growing in circles at the bottom of the plant make some cuts at the bottom of the root ball in order to spread the roots out before it is planted. Bound up roots will prevent the tree from growing very quickly, if at all. Plant at the correct depth - the "trunk flare" of the tree is where the roots start to expand away from the trunk of the tree. This should be visible when the tree is planted. It is much better to plant the tree a little high as opposed to a little low. The tree will settle over time. Back fill around the roots - Adding compost/peatmoss/topsoil before putting the tree in the ground is good, just don"t get carried away with it. You want to pack the soil back in the hole just firmly enough to hold the tree in place. Getting oxygen to the roots will go a long way in helping the tree establish and grow quickly. If you plant the tree properly, you will have soil left over when you are Finished..
Crabgrass is an annual with branching, spreading stems. Its coarse, blue-green to purplish leaf blades can be smooth or hairy, depending on the species. Flower heads with several fingerlike spikes rise from narrow stems. Crabgrass thrives in lawns mowed shorter than 2 inches, underfed lawns, and those watered frequently and lightly. Thick, deeply irrigated turf is the best control. 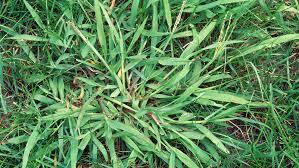 Dig crabgrass before it seeds. 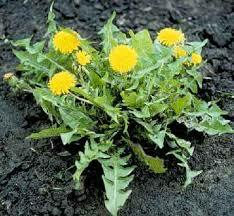 Preemergence crabgrass herbicides are available; apply in spring before soil temperature reaches a steady 60 degrees F.
Dandelion is a broadleaf perennial recognized by bright-yellow flowers and a large, flat rosette of leaves rising from a long, fleshy taproot. Dandelions favor thin turf. Pull or dig out young plants before they go to seed. Then cut any regrowth from leftover root pieces. You can also spot-treat weeds with a selective broadleaf weed killer. 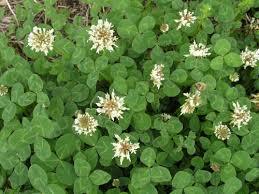 White clover is a broadleaf perennial that used to be included in grass seed mixes. Also called white Dutch clover, it's distinguished by three-lobed leaves with a crescent-shaped white band. 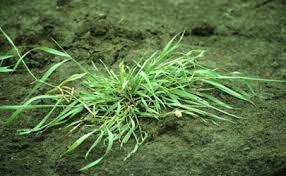 The plant spreads by creeping stems and thrives in sparse, undernourished turf with excessive moisture. Control it by watering well, applying nitrogen fertilizer and avoiding excessive applications of phosphorus. Spot-treat with a selective broadleaf weed killer; a second treatment often is needed. 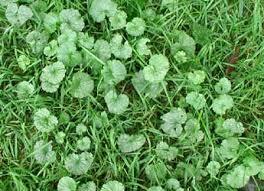 Ground ivy is a broadleaf perennial with square stems and bright-green rounded leaves with scalloped edges. It reproduces by seed and creeping stems that root as they touch the ground. Also called creeping Charlie, it prefers damp soil and shade. Improve drainage and water less. Pull stems and roots of young plants. Spot-treat with a broadleaf postemergence herbicide. 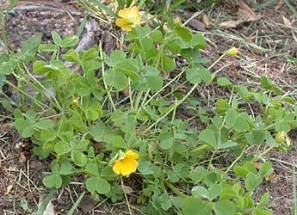 Yellow woodsorrel is a broadleaf perennial, although it might act as an annual in some regions. Also known as oxalis, it has cloverlike leaves and yellow flowers, each with five petals. Plants spread by roots and seed. This weed is difficult to control, and does best in thin turf watered frequently and lightly. Water thoroughly and fertilize properly. Dig out small plants or spot-treat isolated ones with a postemergence weed killer. Prevent new weeds with a preemergence herbicide with oxalis on the label. Quackgrass is a perennial grass with flat light-green to blue-green leaves. It spreads by seeds and aggressive underground stems, called rhizomes. Thoroughly dig out roots and pointed rhizomes—remaining pieces regenerate new plants. Spot-treat with a nonselective weed killer. Yellow nutsedge is a grasslike perennial sedge with triangular stems and 1/4-inch-wide leaves. 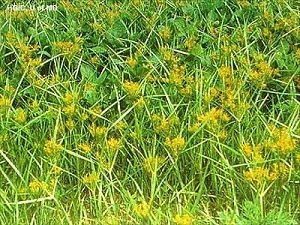 Also called yellow nutgrass, it reproduces by seed and tubers that grow at the root tips. Tubers often persist in the soil, making established plants difficult to control. Mow high in early to midsummer and water infrequently though thoroughly. Spot-treat with postemergence herbicides labeled for nutsedge. As with most weeds, control is easiest when plants are small. 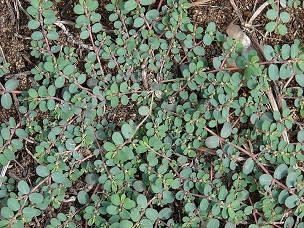 Spotted spurge is a broadleaf annual that grows close to the ground in a fast-spreading mat. Its small leaves are green with a brown-red spot on top. Cut stems exude a milky liquid. Spotted spurge reseeds heavily. A high-mowed, well-fertilized and vigorous lawn provides tough competition. Pull isolated plants before they seed. Spot-treat with a postemergence weed killer and use appropriate preemergence herbicides to prevent new weeds.